We have gathered data from our extensive professional network of over 7,000 candidates to give you salaries broken down by skill and seniority. We hope that this will help give you an accurate picture of the current job market. 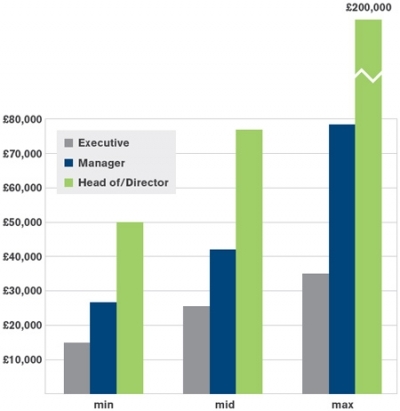 We’ve taken a cross section of the industry as a whole, to show you the break down of lower, middle and upper salary bands by each level of seniority. Here you can view salary according to area of specialism. 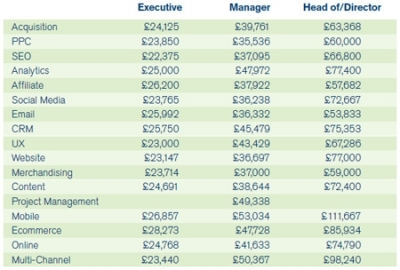 These are current average salaries taken from our database and are intended as a guide. Not all roles in all companies fit this guide (for example, the Head of E-commerce for a top 10 online retail site is likely to earn more than the Head of Ecommerce for a fledgling online store). But this gives you a broad idea, and you can compare each to the industry as a whole.